Children need a place to express themselves, especially those with creative or artistic ideas that aren't conducive to the space within a house. They also need a place they can access quickly when getting caught in a storm while playing outdoors away from the home. 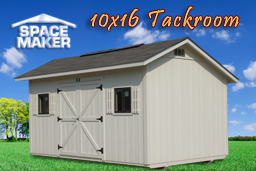 The 8x12 white playhouse we offer is big enough for your children and their friends to play in and has a number of items to make it child-friendly. For example, wood doors help to insulate and protect the play house from the elements so that your children are safe in their own little world when storms are raging outside. Such shelters are also effective because they have insulated roof decking and sturdy, high quality windows for protection. Western Fir siding that has a baked on primer, allowing for a longer lasting paint that looks good for years, even with the abuse that children can heap upon a play place. 4x6 pressure treated runners and 2x4 floor joists on 12-inch centers, overlaid with smoothly sanded plywood decking, so it's safe for children and sturdy. 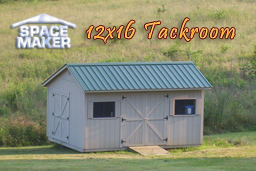 The option for either 25-year shingles or a metal roof atop insulated roof decking, with an overhang on all sides of the building for extra weather protection. 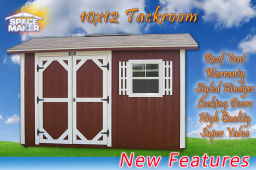 Customizable options for windows, shutters, and shelving. 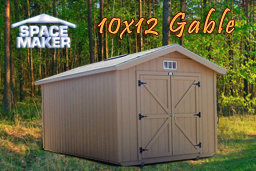 In fact, the 8x12 playhouse is so well constructed that you may want to purchase it for other uses, including as a guest house. You've probably had times where you wished your guests weren't sleeping in the same building and you wanted to remove them to another building. 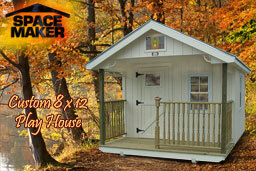 By setting up the playhouse as a guest house, you are doing just that! It allows for greater privacy, and since the shelter is equivalent to the size of a room within the home, there is plenty of space! If you don't like white or need to match another paint color on your property, let us know, and we can color match to almost any sample. 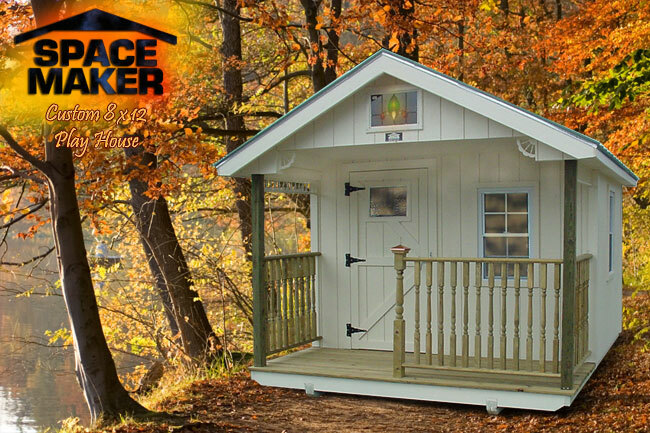 Between wood doors, a shingled or metal overhang roof, and customizable windows and shutters, the 8x12 white play house is a perfect outbuilding to add to your property, whether for play or for purpose. 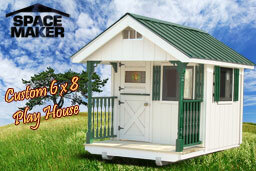 Choose from this and many other custom buildings we can offer you for your needs.